Golden Dozen Solitaire is a free high-quality collection of the 12 most popular solitaire games in the world with amazing graphics and relaxing soundtrack. Choose your favorite solitaire variations including Klondike, Spider, Pyramid and more. 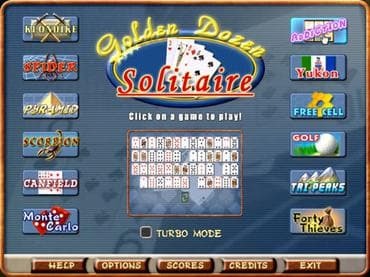 Download free full version windows game today and take a break with this fantastic collection of solitaire games! Free Game Features: - 12 most popular solitaire games; - Amazing graphics and relaxing soundtrack; - Game statistics; - Free full version game without any limitations. If you have questions about Solitaire game, please contact us using this form.